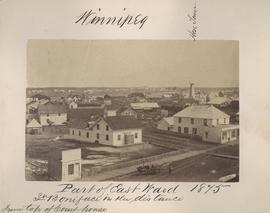 Photograph show Portage Avenue looking east from Main Street. Date of photograph is approximate, ca. 1940. Postcard shows view from Portage Avenue and Hargrave Street. The T. Eaton Co. Ltd. department store is shown at right; Clarendon Hotel is shown at left. Date of postcard is uncertain, [before 1949].